WorldLegacy’s NC168 Leadership Team’s vision is a connected world where people are authentic and free. All humans experience themselves as being heard, respected and loved. We envision a world where people are so authentically connected that we laugh, cry, share happiness and share joy with strangers anywhere in the world. NC168 created an extreme makeover at the Kyrgyz Community Center in Chicago, Illinois. This project created a safe place for children and an environment where families and individuals can come together and share joy, peace, love and appreciation for one another. This is a space for all races, religions, ages, and genders to learn about each other’s cultures, values and traditions, and to create connectivity and respect. The children will see first-hand how amazing it is when people are connected and supportive of one another. This project created a computer room for children, added technology to the meeting hall, created a playroom with play equipment and toys in the playroom, and created a kitchen and dining space. The computer room and playroom were painted, and the carpets were cleaned. In the computer room, the team installed ten computers, ten desks, a wireless router, ergonomic chairs and a smart board. In the playroom, the following was provided: a bookcase, rug, large start TV, storage for toys, a Little Tikes Hide and Slide Climber, toys, a child’s table and four chairs. In the hall, ten framed pictures were mounted on the wall of the seven states of Kyrgyzstan. A bookcase was installed for books where children will have an opportunity to learn about the history of the United States and Kyrgyzstan. Technology included a large smart TV and a surround sound system with microphones. The team created a space with two couches and a love seat. The office was provided with two computers and smart TV. In the kitchen, the team provided a white kitchen storage cabinet, dishes, four tables, sixteen chairs and a dishwasher. 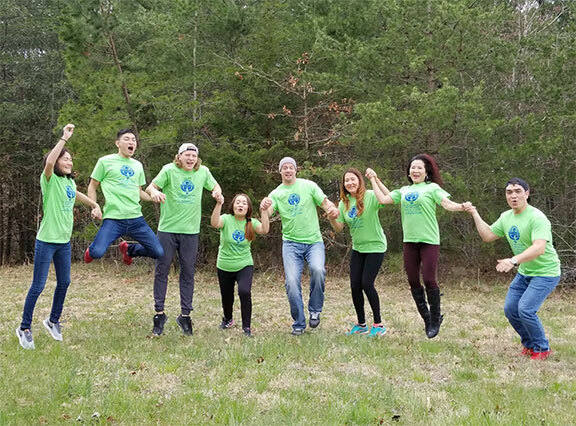 A WorldLegacy Leadership Team, based in North Carolina, will complete an extreme makeover at the Kyrgyz Community Center in Chicago, Illinois, beginning on Friday, March 9. In less than three days, the team will build a computer lab, children’s playroom, paint rooms, install carpeting, add technology to the meeting hall, and update the dining room and kitchen area. This is the 168th class of the WorldLegacy program, and the first time they will be working in Chicago. Team members are travelling from Minnesota, New York, North Carolina, as well as the Chicago area to create this project. This WorldLegacy Leadership Team is committed to furthering the physical, cognitive, and emotional strength of children, and creating possibility by modeling a leadership role in the world. The WorldLegacy Leadership team invites all to come and participate. The adventure begins on Friday, March 9 at noon and 8:00 a.m. both Saturday and Sunday at the Kyrgyz Community Center, 6002 N Keating Ave, Chicago, IL 60646. The official ribbon cutting ceremony will begin at 6:30 p.m. on Sunday, March 11. The ceremony will celebrate and honor all donors, volunteers and leaders who gave of their time, talents and resources to make the project a success.